Wenzlau Engineering offers a multitude of ancillary equipment designed to enhance our main products including surface wire ground systems. The MK-2551 A/U is an alternative grounding system that has been designed primarily for use with systems requiring high mobility. It is easily emplaced and removed, offering a reasonable option in situations where driving/retracting conventional ground rods would be difficult and/or too time consuming. It was originally conceived in the Human Engineering Laboratories (now Human Research and Engineering Directorate of Army Research Laboratory) Grounding Analyses I and II, performed in July 1987. The conclusion of the analysis was that surface wire grounds are equal to or superior to ground rods in terms of electrical properties and that they are easier to install and remove. Resistance to ground is based on the ability of the earth electrode, i.e. the surface wire stake or ground rod, to transfer the current to the bulk of the earth surrounding it. Resistance has a significant dependence on the surface area that a stake or ground rod has in contact with the earth. 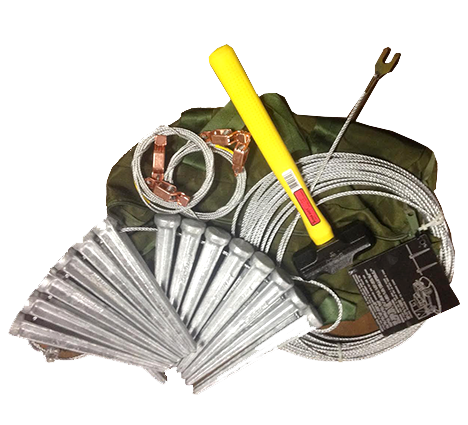 Because the Surface Wire Grounding Kit (MK-2551 A/U) stakes have a combined stake surface area approximately 50% greater than a standard 8-foot ground rod, the MK-2551 A/U provides a path to the ground with significantly lower resistance. Resistance is further reduced through additional contact area provided by the wire routed between the multiple stakes. Comparison testing between the MK-2551 A/U and the MX148/G (standard 8 ft. ground rod) at Redstone Arsenal Technical Test Center, Alabama, utilizing typical grounding situations, provided the following results: R () MK-2551 = 39.5; R 90 Ground Rod = 160. Additionally, lightning tests show the MK-2551 A/U surviving several exposures to maximal lightning current while the #6 AWG braid deployed with the standard ground rod fractured in several places after exposure.